서울의 노인인구는 2005년센서스기준71만여명을 상회하여 전체 인구의 7%에 이르렀다. 이는 10년전 대비 약 75%이상 증가한 것으로 서울이 고령사회로 급격하게 바뀌고 있음을 알 수 있게 한다. 국제연합(UN)은 65세 이상 인구의 구성비율이 7%가 넘는 사회를‘고령화사회(aging society)’, 노인인구가 14%가 넘어설 때‘고령사회(agedsociety)’로 규정하고 있는데, 2005년 기준 서울은‘고령화사회’를 지나 ‘고령사회’로 나아가고 있다. 한편, 이러한 고령사회로의 변화 속도로 인해 사회가 해결할 문제들이 점증될 수 있는데, 서구 사회에서‘고령화사회’에서‘고령사회’로 넘어가는데 50년에서 100년의 기간이 소요되었으나 서울의 경우 세계에서 유래가 없을 만큼 급속한 속도의 고령화를 경험하고 있다는 것이다. (노년인구/소년인구)×100 으로 계산되는 고령화지수는 노인문제 전망에 주요 지표로 사용되는데, 2005년 서울의 고령화지수는 44이다. 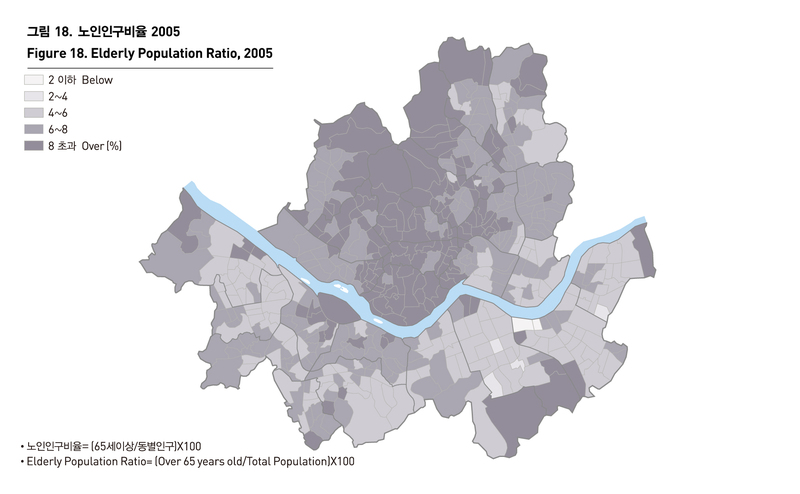 The number of Seoul’s elderly population topped 710,000 by the standard of 2005 census, reaching about 7% of the total population. The number of elderly population rose by more than 75%, compared with a decade ago, showing that Seoul has rapidly transformed itself into the aged society. The UN defines a society with more than 7% of the population older than 65 as aging society, and a society with more than 14% as aged society. 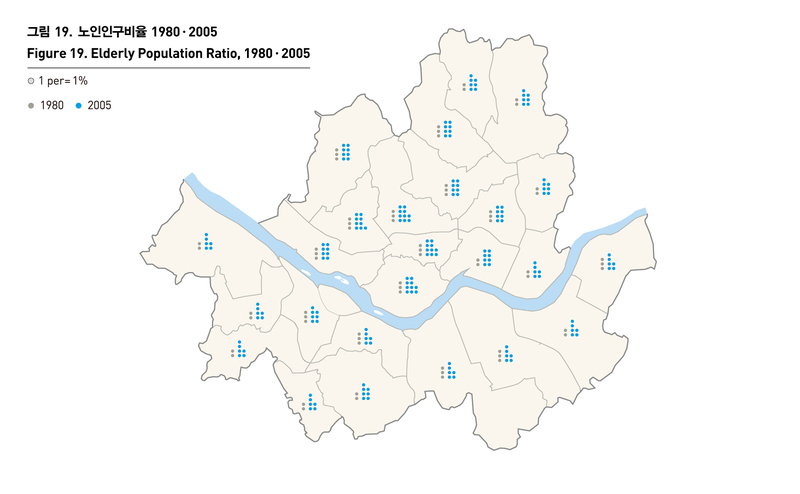 Seoul has been shifting from the aging society to the aged society as of 2005. The rapid transformation into the aged society can complicate problems facing our society. It took usually 50 to 100 years for advanced nations to shift from aging society to aged society, but Seoul’s speed of moving into the aged society is unprecedentedly rapid. The aging index,(elderly population/child population)X100, is used as a major indicator in predicting the issues related with the elderly, and Seoul's aging index stood at 44 in the year of 2005.